Tea in general has been a huge interest of mine ever since I can remember. I especially have a fairly decent collection of Chinese Tea – ranging from Pu’er tea cakes through to high mountain greens. It still amazes me how all teas types generally come from the same plant (camellia sinensis), but due to harvesting & processing techniques, they vary so distinctly in their character and flavour. Generally, teas are enjoyed hot / warm. Most of us are used to brewing tea with hot water – because that is the way we are taught. Ask someone if they have ever brewed tea with cold water and the answer will probably be no. Most teas do need a high water temperature to extract the most flavour & nutritional benefits. For example, Pu’er tea needs boiling water – or water in the high 90 degrees (Celsius) to get a proper brew and extraction. Green tea’s benefit from a temperature ranging from 70 – 80 decrees Celsius. But although teas require hot water for immediate drinking, they can also be brewed with cold water, the main difference being that with cold brewing, time is the key. I first came across cold brewed tea when visiting a green tea farm in China. The lady taught us to add some Green Tea leaves to a bottle of room temperature water, letting it steep for a few hours before enjoying it. 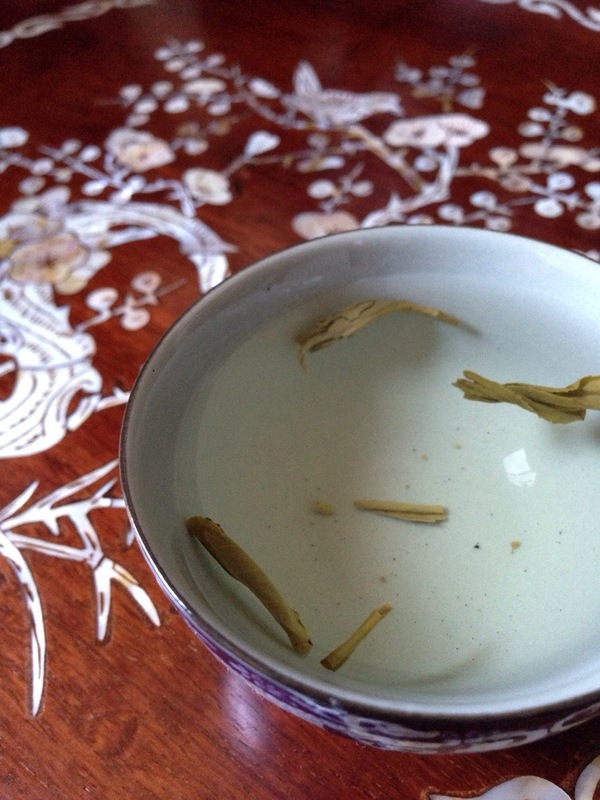 Since then I have been experimenting with not only Green Tea, but with Oolong & Jasmine as well. I have come to realise that brewing tea in cold water really unlocks a whole different drinking experience. – The tea tastes fresher and has a ‘zing’ – as if biting into a fresh granny smith apple. – The tea is more fragrant. – The tea is more refreshing. When left in the fridge overnight, it is so good on a warm day (and just as good on a cold day too). – No matter how long you brew it for, it never becomes bitter. Through my experimentation, I have come up with a really simple formula (it probably didn’t need that much experimentation) to make cold brewed tea. If you use the following ratios, you will get a very nice refreshing flavour – whilst not being too weak or strong. – In a carafe or non smelly container, empty in the dry tea leaves. – Pour in the water & swirl it around. – Leave in the fridge overnight to steep properly. It becomes a beautiful, light straw colour. – When you want to drink it, decant with a sieve to filter out the large leaves. – Enjoy it on it’s own or with your meal. Also, here is my explanation I mentioned earlier about the main benefit of cold brewed tea. Hope it doesn’t bore you to tears. When you drink hot tea, your sense of taste is muted – and it starts with your hands. But first I will talk about smell. Smell is the first ‘contact’ you have with drinking hot tea. The smell is made up the tea aroma as well as steam. This goes into your nostrils, alerting your mind and stomach that something is about to go in. Then, the actual physical stimulus is when you hold the cup. Most people habitually touch the cup in one way or another before they drink. One hand is on the handle. the other ‘cups’ around the other side. This give them an idea of temperature and the tactility forms part of the experience. So already, your sense of touch is sending signals to your brain, telling it that what you are about to ingest has temperature, and in most cases, is hot. Next, you place the rim of the hot cup of tea in front of your mouth, feeling the heat of the tea radiate off the porcelain surface on to your lips. Then, you sip. When you sip, you subconsciously focus on ensuring that enough air is incorporated into that slurpy sip so that it doesn’t burn your mouth. Then, when the tea is in your mouth and your know (subconsciously) that it’s not going to burn you, you swallow. When you swallow, that whole warming sensation fills your throat, all the way down to your stomach. And that is how I feel that we generally enjoy tea. So what I’m trying to say here is that when you drink warm / hot tea, your senses are in overdrive with the physical aspect of drinking – the heat combined with the tactility of the whole process almost blankets (but doesn’t block out) the flavour of tea. On the other hand, for cold brewed tea, you have removed the ‘hot’ aspect so you automatically focus on the flavour and smell – really bringing it to life. Hope you all try it out! I’ll have a go now – sorry for the spam! hmm it looks like you have to do it yourself as there’s no way for me to un-notify you? sorry!